An unusual and exciting product that combines all the fun elements of dancing flames, shimmering water, floating fish, magical stars, blooming flowers, fluffy clouds and visual auras into one single system. 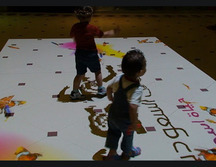 With the element of surprise, users become captivated with the interactive floor. The Interactive Floor System is unusual, exciting, and modern. It not only reacts in real time, but in a unique way can create and send powerful messages by way of advertising, brand re-enforcement and establishing corporate identity. Imagine for a moment, if you will, walking into a fish restaurant, over a swimming pool filled with shimmering water, goldfish swimming through the water and over the restaurant´s logo. Then, as you walk you see ripples in the water, hear the sounds of your footsteps and see the fish darting away from your feet. This is all possible at the same time with the Interactive Floor System using our AdVis 2.1 Interactive software. Similarly, if you place this system into a corporate function, guests can walk over the pool and corporate logo at the beginning of the event, but part way through the scene changes and the system presents something else — creating a dance floor that is always affected by the dancer´s movements or an interactive game that engrosses the users attention. Each effect is completely configurable, you can insert your own backgrounds, logos, videos, sounds, settings etc. very easily using built in configuration dialogues that are extremely easy to use. This enables you to create an unlimited number of unique effects as well as having an unlimited amount of different advertisers on one floor. All you need to complete an interactive projection system is a PC and projector. We also highly recommend a light coloured floor (ideally white) for maximum impact and it is imperative that existing ambient light is controlled so as not to detract from the overall projection.